I have made more Butterfly wings as Christmas gifts. The pattern is Butterfly Wings Wifemade. It is a pattern that once you have it in your stash you can make it numerous times you just change the fabric and applique, the possibilities are really endless. This year I cut all my fabric pieces out of unbleached calico and hand painted them with liquid radiance. I painted a set of wings each time so I kept the colours consistent using the same combination of colours for that one pair. I love painting fabric with liquid radiance. If you are not familiar with the product it is a fabric paint rather than a dye. It isn’t a messy product so it is perfect to use in doors and providing your not doing sun printing where you need sunlight it isn’t weather dependent so you can use it any time. After the success of using glitter felt on the pair I made last year Christmas I once again used it. This year I was a little more free hand with my shapes. I folded a felt piece in half and cut as many shapes out of it as I could so I would get 2 of each shape. I put all the pieces in a bag and just randomly selected shapes for each wing based on the colours. 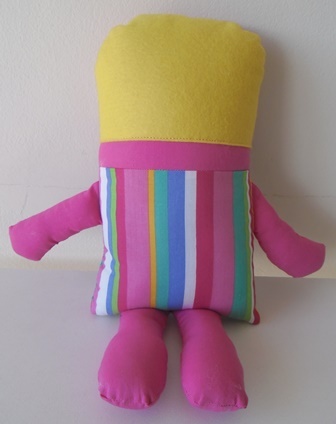 I deliberately chose felt colours that would go with the painted fabric. I did have a minor construction element detour shall we call it with some (ok half) of these wings. When I did pattern magic to create the centre seam I must have had excess fabric that didn’t get enclosed in the seam so I was left with some raw edges. Unfortunately the area is very hard to than machine sew over so I couldn’t use glitter felt to cover it, the glitter coating makes glitter felt a little tougher to hand sew through. I raided my felt stash and found suitable regular wool felt so I hand stitched that in place to cover it. As these are hand painted each wing is an individual and the extra centre spine of wool felt just adds to that. I am really glad I thought of using a nappy pin to turn the tubes. It made the job of turning the tubes and later threading the elastic through a breeze. Just before it came to doing the elastic I found a box of similar size pins at the shop, they call them large safety pins. I am glad I purchased them as I was using 4 per set of wing straps when I did the elastic. I found the pins at what in Sydney we call a $2 shop, a small independent shop that sells the most random things from gift wrapping to sink plungers very cheap. Sometimes you come a cross little gems and my large sewing pins were gems. I do like these wings. They will be fun for the girls who get them this Christmas. They were also fun to make. I loved painting the fabric and thinking about each item I was creating. I loved the process of picking what felt shapes to use on each one. Even the process of overcoming the seam debacle got my brain thinking of what skills do I have and resources available to fix the issue. I honestly think I get more out of the items I make than the person receiving them does. Kitty Kate is the last of my birthday gifts for 2017. Once again this is another Funky Friends Factory pattern. 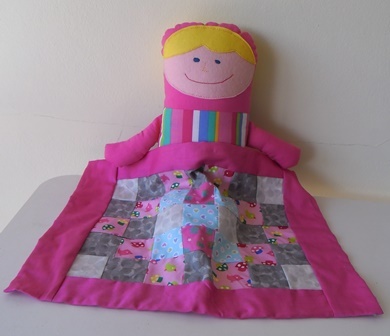 I have used a lot of Pauline’s patterns this year for my gifts. I would say this one is mid range difficulty, there wasn’t an additional step by step tutorial aside from instructions in the pattern like some of her toys have but you didn’t really need it as there wasn’t anything too unusual to the pattern that you might need help with. My scrap fabric boxes are getting a bit out of control to the point where I need to seriously go through them and cull any pieces I know I will never use. The other thing is that I need to start using my scraps more. I found a bag of purplish scraps. 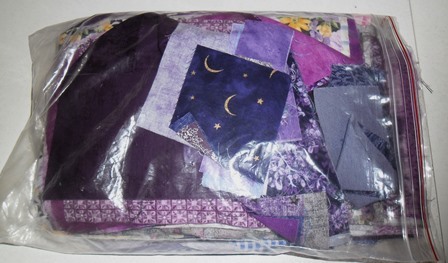 I used these same scraps when I made the Purple Pillow back in 2014 and I haven’t touched the scrap bag since. From the pack I was able to find fabric to fit all the pieces of Kitty. When picking the pieces for each section I tried to balance it out so although it was all a miss match it looked nice and not like a dog’s (or cat’s) breakfast. What I really liked about this toy is that you stuff her limbs once she is constructed which is my preferred way to do them. I find it so much easier to do it this way, I am really pleased with my ladder stitch on these too. Her tail I accidentally put upside down, it is meant to stick up. It has elastic in the tail and I don’t think I stretched it enough so it doesn’t have the full curl like it is meant to. 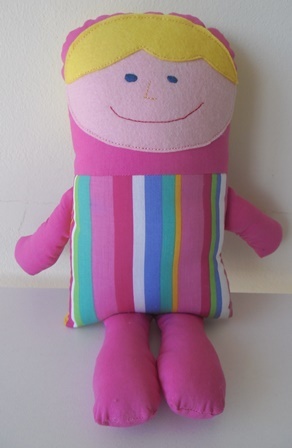 She is a nice size toy, perfect for cuddling and stands upright by herself. I like Kitty Kate. I am hoping Miss 4 likes her too. 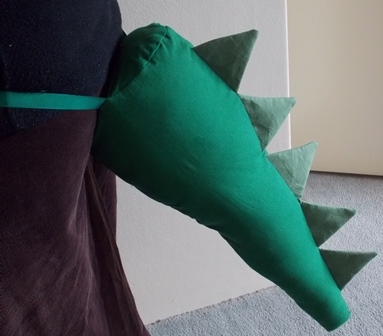 I was planning on making a dinosaur tail earlier this year for a gift for this child but the fabric I had chosen wasn’t suitable, it was a stretchy knit type fabric and I thought it was going to end it tears if I tried to use it. 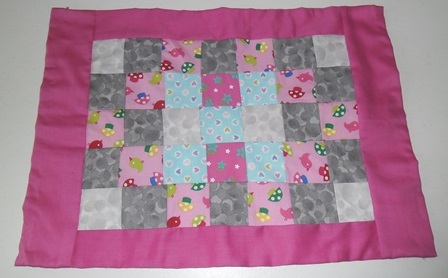 The pattern I used was a free pattern by Running With Scissors, it is a great little tutorial to follow. I think I pinned this on Pinterest years ago and hadn’t got around to making it until this year. I did do a couple of modifications to the original tutorial. Instead of doing straps that go around the waist to hold it in place I used cross grain ribbon. I wasn’t sure the size of the child so I didn’t know if the straps in the pattern would fit him. I thought by using ribbons it can be tied around him no matter what he was wearing or how he wants to wear it (he could even wear it on his head if he wants) The other modification I did was inside the spikes I used a fusible interfacing to stiffen them. I’m not sure the exact one I used but it like a heavy Vilene, I have used this before in bag making and fabric buckets. The spikes are still flexible but hold their shape. The easiest way I thought to add this was iron a flat rectangle piece of interfacing to the spike fabric first and the follow the rest of the tutorial. I used pinking shears to cut the spikes once they were stitched. My spikes are a little bit shorter than the pattern and that was due to the size of the scrap of interfacing I had. When your making something you make the rules and this dinosaur has spikes that don’t go to the end of his tail. The fabric is regular homespun I brought at the local shop, I was happy to find these colours as I had it my mind to be something like this. The ribbon I found in my stash that happened to match perfectly, I did seal the ends of it with a match to stop them fraying. I also had a to add a touch of fray stops to one of the spines as it didn’t fully catch in the seam but it should be ok. So who says you can’t make these for adults. Ok so this one doesn’t exactly fit me but if the ribbons were longer I think it would. 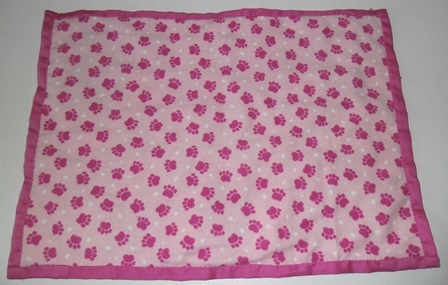 The finished size of this one is around 23″ long (it will be fun trying to find a bag big enough to post it off at Christmas) You could make it any size you wanted by following the directions in the pattern and adjusting your fabric. This was really quick to make so perfect for those last minute gifts or for a kids sleepover or when the kids are board and want to make something. The first of my 2017 Christmas gifts have been finished. 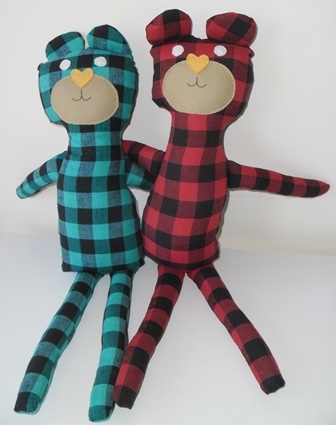 For a pair of siblings I decided to make matching Hipster Teddies. 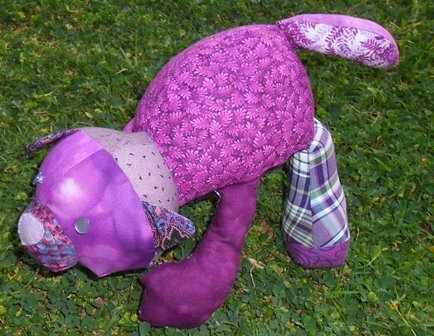 One of the testers who made this toy prior to its release in issue 15 of One Thimble magazine made the teddy in a check print fabric and it looked good. Recently I was able to find check fabric in 2 colourways at my local shop and I thought it would be perfect for these bears. It really was a case of buy the fabric, prep it in the washing machine as soon as you get home, cut out the pieces the next day with these bears. In my felt scrap stash I was able to find all the facial features so they matched too. 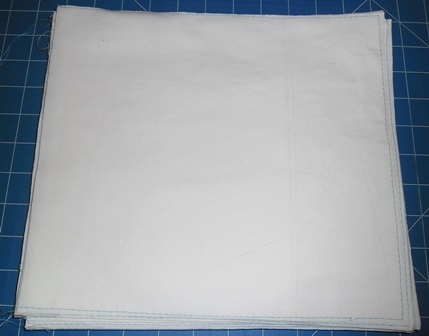 The fabric isn’t a quilting cotton it is more like muslin or a linen perhaps. It is a lighter fabric and the weave isn’t as dense as a quilting cotton. It wasn’t so open weave that I needed to use double layers on all the pieces but I was worried it would fray as I stitched it so I cut out all my pieces with my pinking shears. This ended up serving 2 purposes. 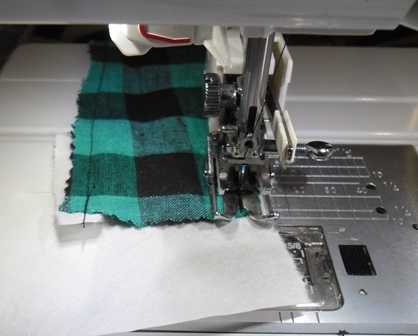 I didn’t need to go around and clip all my seams after I stitched them. 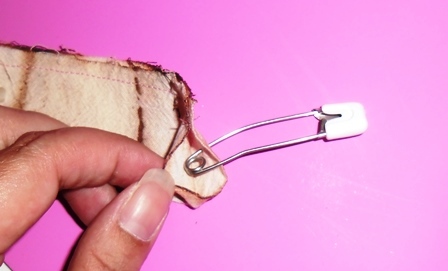 I’m going to cut my pieces out with pinking shears again I think as it was a big timesaver. I did have to clip into a few inner curves and cut away excess fabric from my seam line when I stitched in the limbs but that is only a couple of snips. I added pellon inside the ears again to make them squishy. If I am not stuffing the limbs or the ears I like having the pellon or wadding in that section just to plump the area up. Toys are meant to be cuddled and I like them to have that inviting feel that makes you want to snuggle up to them. These bears were a really easy project to make multiples of. I cut each bear out at once. Where possible if the fabric is non directional I fold the fabric so I have 4 layers and cut out any pieces that way, if your fabric isn’t thick as you long as you have enough pins it is easy to do. 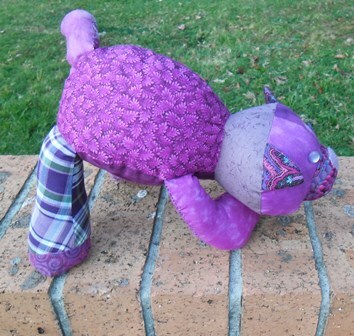 On these bears I used black thread and chain pieces all the ears and limbs. 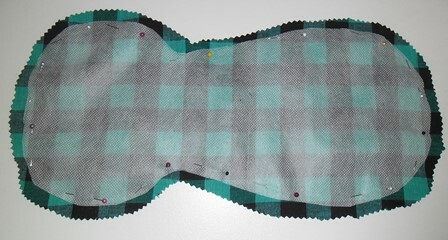 I knew the machine would eat the fabric so at the start and end of each seam I placed tearaway stabliser underneath it. None of my pieces got caught in the feed dogs and it only took seconds to remove all the tiny bits of paper from the stitching when I was done. 2 gifts down more to go!